The most resistant material is neither steel, norcement, nor wood, nor stone, nor steel, nor even glass. The most resistant material in building construction is Art. 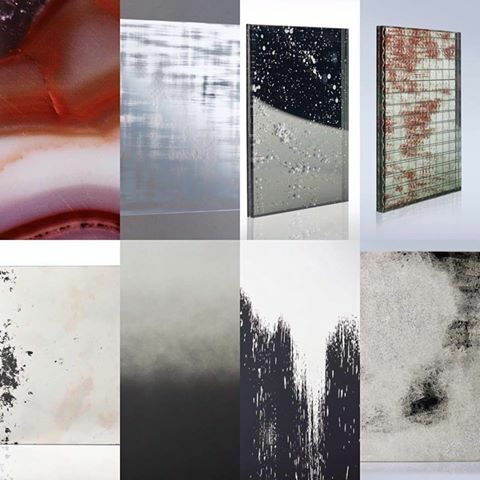 Glass is a versatile, almost magical material- it can change its colour, shape, appearance, it can become a real work of art, a design object or almost “disappear” on a clean sliding wall. Not only glass has a leading role in the new vbessenza collection: mirrors, meshes, colours, different materials combine to produce impressive, unique and unexpected effects. Imagine a blank canvas to be filled according to your wishes, to be painted, spotted, varnished. Think about a mirror, a common but essential object, being revised, reworked, made to appear older. Take a glass, a plain clear glass , and make it unique, refined – combine it with fabrics, resins, metal sheets … scratch it, transform it. Only once having done all that and adding a fair bit of creativity, passion, commitment and experience you will get vbessenza. Glass that becomes matter. The gold leaf technique, mainly used by artists and craftsmen during the Renaissance, is still employed in the same way. This process has remained unchanged for centuries: 22 carat gold foils are applied by hand on a thin layer of glue. The processing technique is meticulous and requires the use of sable brushes, the only ones that, thanks to their softness, can spread the material without any damage. The gold leaf decoration is increasingly used to create uniquely refined stained glass, in order to give character and elegance to any space. This technique enables to make small decorations on the glass, such as mirror frames or finishing touches on furnishing accessories. Similarly, it can be used to give new light to the walls, thus redesigning the traditional wooden paneling. “A precious room where the out-of-the-ordinary meets femininity, creating an oneiric and unexpected world. Deconstructed and overlapping geometric shapes are the common thread of this project involving every element, from the walls to the wall lamps, from the wardrobes to the carpet, from the furnishings to the fabrics. Each element reflects the complexity of female imagery”. 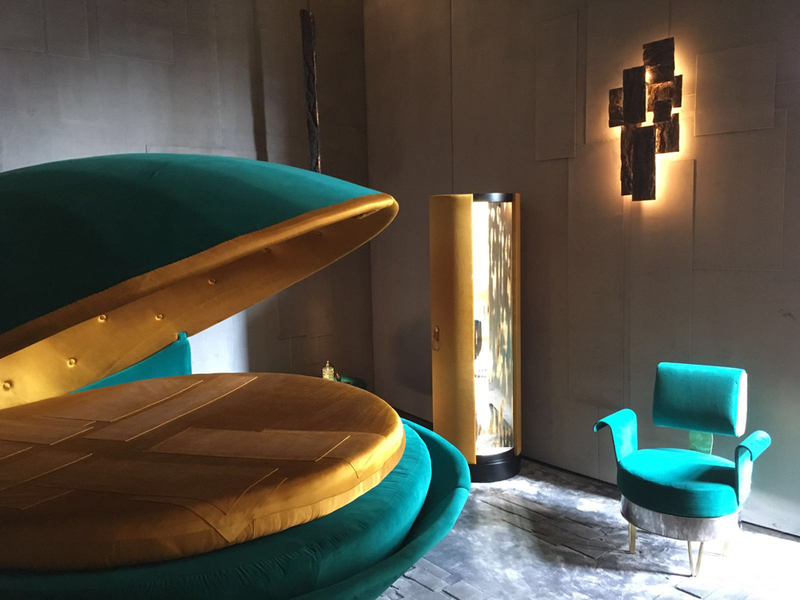 So the architectural firm Baciocchi Associati describes the Room presented in Paris, on the occasion of the exhibition by which AD Intérieurs celebrates every year the biggest furnishing professionals. 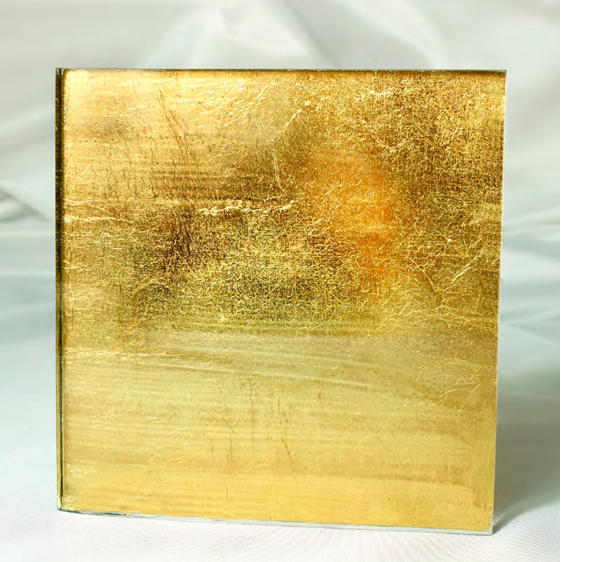 For the event we have made a particular antiqued mirror with gold leaf. A special thanks to Baciocchi Associati for giving us the opportunity to participate in this unique event, which took place in September in the beautiful setting of the Monnaie de Paris.